Tired of the same old holiday cocktail parties you go to year after year? This year, kick it up a notch... or maybe we should say down a notch, with a hilarious ugly Christmas sweater party! Just because the sweaters are going to be ugly, doesn't mean your invitation has to be! As you'd expect, Etsy is brimming with ugly sweater party invitations that are customizable. This Ugly Knitted Sweater Christmas Party Invitation ($20, viavaciousdesigns) is available via PDF, so you can print it, email it or share it on Facebook easily. 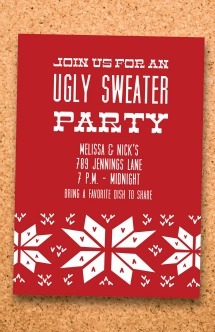 Or, try this easy-to-use Ugly Sweater Party template on Evite, which is great for tracking RSVPs. Another option is to pick up the sweaters yourself, letting guests know that they can pick one out, when they get to the party. We're pretty sure that all of your guests will show up on time — nobody wants to be stuck with the last ugly sweater! Depending on your crowd, you may choose to hold a contest for the best, er, worst sweater at the party. The reward for the winning sweater? How about a sweater that isn't as ugly? For a fun, festive party game, ask each guest to bring an ornament for an ugly ornament exchange! In fact, most of us probably have an ugly ornament somewhere in our collection at home that we'd love to see passed on to a friend. This is one party that you probably don't need to put much thought into the decorations, as the sweaters are going to be the only thing your guests are looking at anyway! If anything, paper chains and colored lights would be the best complement to an ugly sweater party. When you're out buying your own sweater, grab some extras for a crafting session! Cut up the sweaters to make ornaments in the shapes of Christmas trees or stars, using cookie cutters as templates and cotton balls as stuffing. 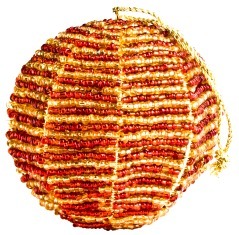 It's amazing how an ugly sweater can be transformed into a pretty adorable ornament! You're wearing ugly sweaters that hopefully didn't cost you more than $5. The last thing you need is a fancy-schmancy, fully-catered spread at this party. Take the food down a notch for this party too. Think, easy and cheesy to match the wardrobe: corndogs, mini-donuts, root beer floats. Your guests will love that you kept the food fun! Did one of your guests show up without an ugly sweater? Is she, gasp, wearing something cute? Put her on the naughty list and make her draw a silly task out of a bowl full of suggestions. From standing on a chair in the middle of the room singing "Jingle Bells" at the top of her well-dressed lungs, to playing the classic how-many-marshmallows can you shove in your mouth game of "Chubby Bunny." She deserves it for making the rest of you look bad! On their way out the door, give your guests the chance to donate their sweaters to a local charity. It's not like they can sport the same ugly sweater again next year, right? Put a bin next to your front door for sweater donations and drop it off at your local church rummage sale or favorite clothes-collecting charity.